6 week project from designing to developing construction drawing set to final construction. To design and construct a lightweight hoop house to protect plants and extend the growing season during the winter. A construction drawing set and a 1:6 scaled model was required before final construction could begin. Focus on air-tight design using two main materials of steel conduit and green house plastic. Three layers of plastic along the seam of the plastic opening ensured air-tightness and allowed for snapping of the buttons without the use of a support on the backside. Our design also focused on simplicity of the module to fit within the 10' conduit, the shifted and alternating peaks to generate an organic roof curvature and two sides held stable with the use of minimal cross-bracing. Addition materials used included grommets, snaps and hose clamps, all of which were included in a budget of $125. Through this project, I developed a better sense of what a construction drawing set requires and how clarity is important not only to myself as the designer and creator, but also to the client who would read the drawing set. 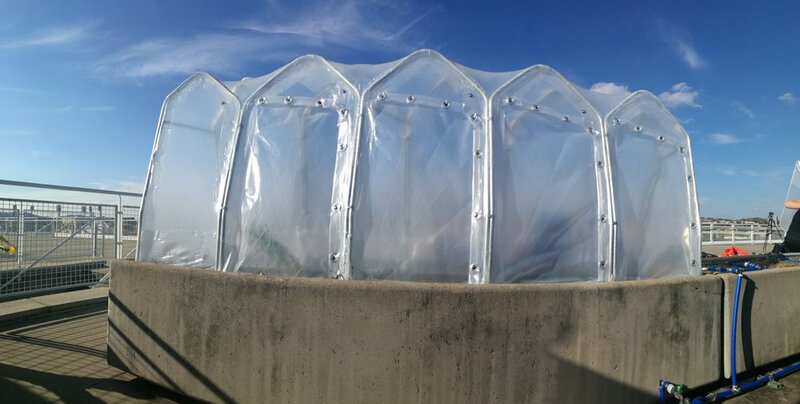 Although we had many iterations of design and construction drawing set, it was through those experiments with different materials and design that we were able to construct an air-tight hoop house that sits steadily despite the strong winds along the Allegheny River. Anchors were placed into drilled holes in the concrete planter bed to attach the hoop house onto the planter.